On Demand shows events that can be triggered manually. The displayed events are available to be triggered immediately. 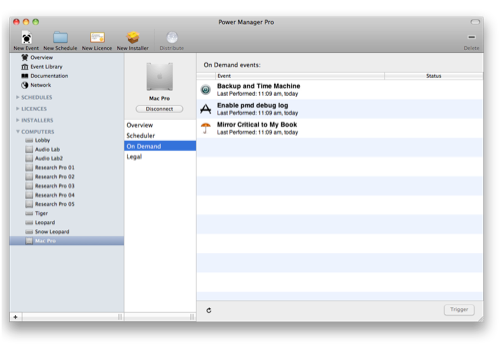 The events listed here mirror those shown in the Power Manager status menu bar. For an event to be displayed in On Demand, the event must support a behaviour called can perform on demand. This behaviour is optional and can be added to any event using the editor. On Demand also shows when an event was last performed. This date and time shows when the event was last successfully performed. On Demand shows events that are immediately available to perform. When an event is being performed, it will not be immediately available to perform. Performing on demand events continue to be listed, but can not be triggered. The exception to this behaviour, is for those events that support the can perform in parallel behaviour. Navigate to the Computer's On Demand. Select the event to trigger. Click on the Trigger button.